The Brandon Magic Dakin Barlow (MDB) is available in four versions - with Brandon-proprietary or standard 1.25" threads on the male thread end (where it would connect with other eyepieces or adapters), and with 1.25x or 1.5x magnification factors. This listing is for the 1.25x barlow with Brandon male threads. This small Barlow is amazing. It is a true Dakin Barlow in a small package, made with a superb lens, manufactured in the USA. This MDB has Vernonscope Brandon threads. 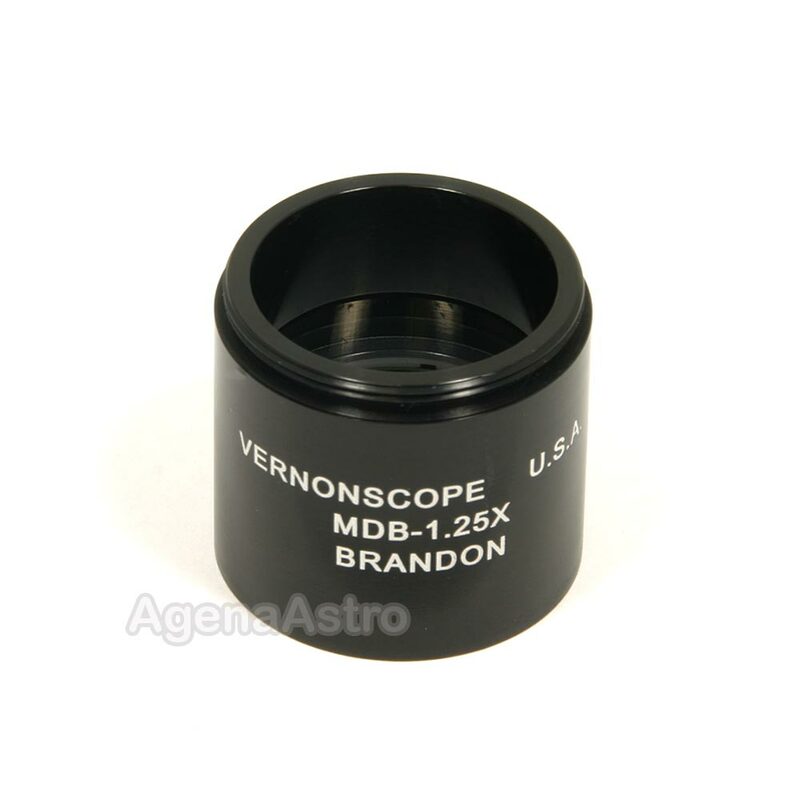 Owners of Brandon and Questar eyepieces use this MDB directly on the eyepieces with no adapter. 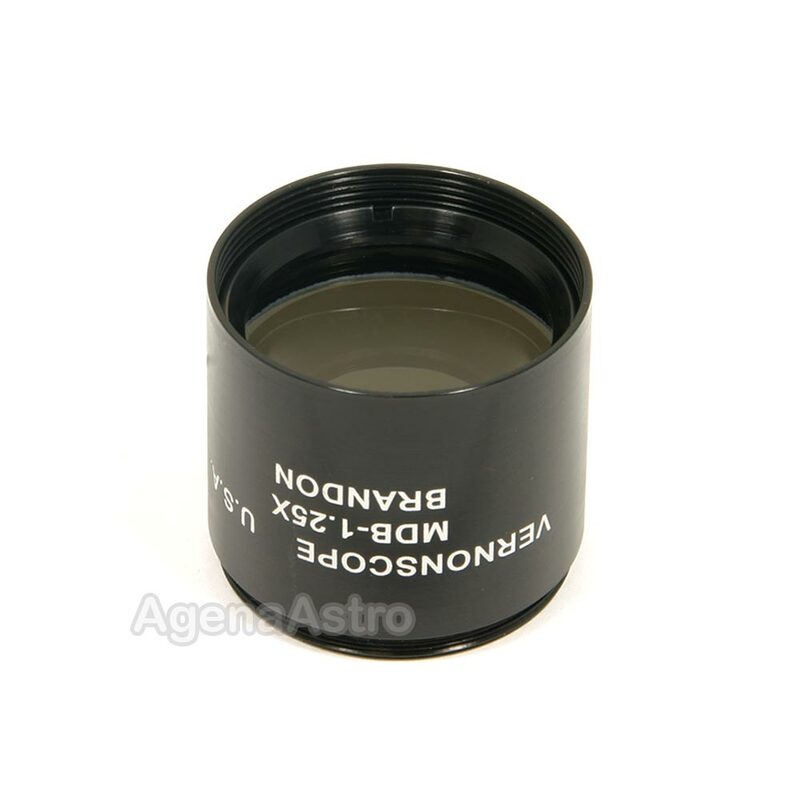 To screw it onto the nosethread of a binoviewer or the standard thread of non-Vernonscope eyepieces, you will require a thread conversion adapter (# 114ADAPTVERN, sold separately). Because of its small size, and the way it screws onto the filter thread of the eyepiece, it fits into 1.25" eye tubes and adapters. Even though it is small, do check when using with a diagonal to make sure you have clearance from the bottom of the MDB to the mirror surface. Please note that the bottom end of this barlow features a female Brandon-proprietary thread. It will accept Brandon filters directly. To use standard 1.25" filters on the bottom of this barlow instead, you will need to first attach Brandon's # 114ADAPTBRNDN adapter (sold separately).